Since the mango season in India is very short, one of the best way to preserve the ‘king of fruits’ is to make a Russian-style jam. Monsoons in southern India are associated not only with cooler weather but also with an abundant supply of mangoes picked during the just-concluded summer. Mango became my favorite fruit after I tried for the first time in the US. Of course the imported mangoes I had in America tasted very different from the mangoes we get here in India. I thought the Mexican mangoes tasted great until I tried south Indian varieties. The English word "mango" originated from the Tamil word māṅgai or Malayalam māṅṅa from the Dravidian root word for the same. The word's first recorded attestation in European language was a text by Ludovico di Varthema in Italian in 1510, as manga. When mangoes were first imported to the American colonies in the 17th century, they had to be pickled due to lack of refrigeration. Other fruits were also pickled and came to be called "mangoes", especially bell peppers, and by the 18th century, the word "mango" became a verb meaning "to pickle". Mango for Russians is one of the most exotic fruits. It’s extremely expensive; one not-so tasty mango will cost you about Rs 200. Few years back I went to the Urals and I brought the whole box of Mallika that was my favorite type of mango at that time. My relatives who had never tried mangoes were fascinated by the taste, the size and the shape of the seed. Mango season in India is very short. 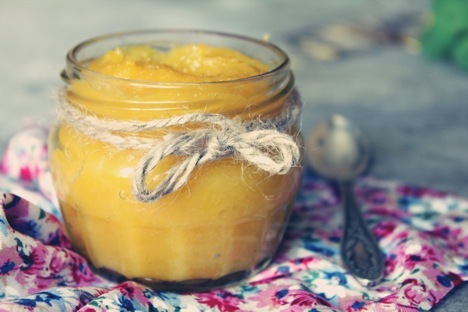 It does make sense to preserve mangoes by making mango jam. I have tried several options and would like to share my findings. Making jam is a time consuming process. The problem is that you can’t just leave jam vessel cooking on low flame unattended. You have to constantly stir it so it doesn't burn. I always look for ways to simplify my life and making mango jam was an exercise in experiments. The first time I left my jam mixture on low flame thinking it will work. Of course when I came back after 20 minutes, my light yellow mixture turned into an amber colour substance and got burnt at the bottom. My apartment got aerated with a burnt sugar smell. My second approach was to make jam in the microwave. I had the feeling that it’s possible. I went on the internet and found out the technique to make jam in microwave. It was extremely simple - mix the ingredients and set the time, mixing several times. The third approach was with the help of a breadmaker. This definitely made my jam making processes extremely simple - put cut mangoes, add sugar, switch on the bread maker. 1.5 hours later my mango jam was ready! The disadvantages of the second and third options are that jam made that way doesn't last. If you keep it in room temperature, it gets molded the second day. Even refrigerated it can't last long. On the other side, my burnt jam lasted in the fridge for 2 years and maintained its beautiful amber color and unique taste. My recommendation: if you want to make mango jam for tomorrow - use microwave for 30 min and it is ready. If you want to make mango jam for the next year - be patient and spend some time in the kitchen. Rule of thumb: any jam is ready and will last if by putting a drop of jam on your finger nail it will stay and won't spread. Proportion of mangoes and sugar should be 1:1 if mangoes are not too sweet and 1:0.8 if mangoes are very sweet. It is better to take semi ripe mangoes and weight them without seed and skin. 1. Peal mangoes and cut into half-inch cubes. Add sugar and leave at least for 30 min to get juice coming. 2. Heat mixture on higher flame and bring it to simmer on low flame. Continue to stir and make sure the bubbles are coming. If there is froth accumulated, remove it with a spoon. It will take 40-60 min to get jam ready. 3. Put jam in sterilized jars while hot and close tight with a lid. You can sterilize jars by putting boiling water. Put a tablespoon inside so the jar won’t crack. Ingredients – same as above. Place ingredients in a large microwave-safe container, stir to combine, let it stand for 30 minutes. Microwave fruit mixture on high for about 6 minutes or until boiling. As soon as the mixture starts to boil, stop cooking and stir. Continue cooking, stirring every 2 to 3 minutes. At about 13 minutes, the mixture should start to get thick. Continue to cook it a couple of minutes more, if it is runny. Pour into prepared jars and refrigerate after the jam cools. I found that the jam tastes better if you add squeezed lemon juice to it.